Danny Plastics Co., Ltd. is a highly-qualified, Taiwan-based supplier and manufacturer of vertical blinds, vertical blind parts, and fabric vertical blinds. The supplier has been recognized as one of the most professional manufacturers in the plastic industry since 1983. With both experience and innovation, the supplier is confident of providing buyers with quality vertical blinds. Vertical blinds have been thought of as one of those necessary things that we really don't give much thought to. They are something that keeps out the sun while adding some decoration to your home. Many are surprised to hear that vertical blinds provide some added advantages. By controlling the light they can save you money in more ways than one. We provide the vertical blinds made of precisely engineering, and our product is specially manufactured to meet various demands from the industry. With quality raw materials and precise inspection at each stage in the manufacturing, we assure you the items are worth buying. Founded in 1983, Danny has been a manufacturer of home appliances for more than 20 years. Lots of related building blocks and applications for different use are all available. The PVC material helps you clean each blind easily when dirt is on. 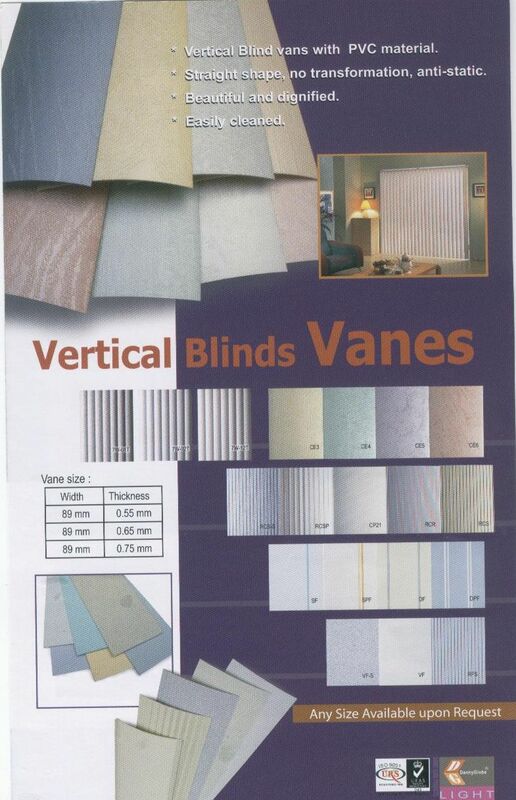 If you are looking for quality vertical blinds, just contact us for more information! Vertical Blind vanes with PVC material. Straight shape, no transformation, anti-static.